Trying out real LED lamps, in my office and around our home, from downlight to nightlight. Reviews of many LED lamps that are we using or have used ourseleves, including some notable failures! 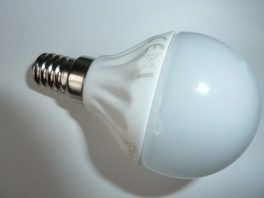 Until recently the most energy-efficient and widely-available form of domestic lighting has been fluorescent; initially in somewhat harsh strip-lights for the kitchen and garage/shed, but more lately as versatile compact fluorescent lamps (CFL) shaped to fit conventional bayonet or screw light fittings and with excellent colour and low price. These are available both for mains electricity (240V AC in the UK) and 12V DC operation such as for caravans and cars and low-voltage display lighting. CFL is generally a GoodThing(TM), as it is about four times more efficient (at around 60lm/W, ie 60 lumens of light out per Watt of electrical power in) than filament (incandescent) bulbs and has a considerably longer life to boot, but its downsides are the relatively fragile tube and small but significant amounts of toxic mercury (Hg) in the tube. CFLs also by their nature require some kind of inverter or ballast that can waste significant energy. Only just about in 2007 did LED (light-emitting diode) lamps start to match CFL in terms of efficiency, and colour rendering has improved too. LEDs are a natural for low-voltage (eg 12V DC) applications, though require some supporting electronics to protect them from spikes, reverse connections, etc. LED lighting is also available for mains operation. It is helpful to understand the notion of 'lumens' for total light output, since the many forms of lighting available have very different behaviour and efficiency. 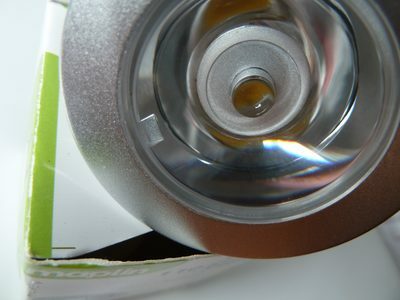 Since September 2010, c/o EU directive 98/11/EC: domestic lamps have (mainly) been required to be labelled with lumen (lm) output more prominently than Watts, which should help with direct comparisons. A lingering limitation on LED lighting in 2012 is power (ie the amount of light produced). 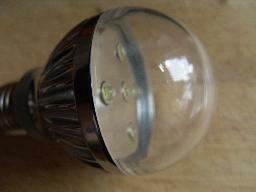 As of 2007 I liked my lighting bright, so for example my then desk lamp in my study was a 20W 1200lm (lumen) mains CFL. At the turn of 2010 I started using the 7W mains 'cool white' EQ60 in an anglepoise which is great, as well as 9W "warm" and 7W "cool" 12V lamps to be able to be 'off grid', and as of 2012 we now have 7W and 10W (roughly equivalent to 40W and 60W incandescents) in several fittings around the house. Note that although the latest round of off-the-shelf LED technology in 2011--12 is passing the efficiency of CFL at 60lm/W, the theoretical maximum efficiency of 'white' lighting is about four times this, so we have some way to go still! And note that LED lamps have no 'warm-up' time, which even new CFLs exhibit. 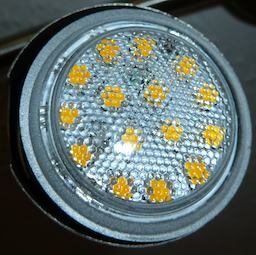 LED lamps, often as drop-in replacements for miniature halogen display lamps, are becoming widely available in the high-street as well as over the Internet, and are passing the efficiency of the best widespread alternative, so we could be on the cusp of a small but well-lit revolution! 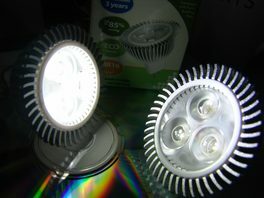 The main barriers to household use that remain as at the start of 2012 are cost (several times that of CFL, though lasting many times longer) and maximum light output (50W halogen equivalent LEDs are still rare). NOTE: LEDs don't like getting hot (you'll get less light and/or shortened life), so be careful if installing in unventilated flush ceiling fittings such as GU10 reflectors, and for 12V MR16s ensure that the transformer is rated 0+. 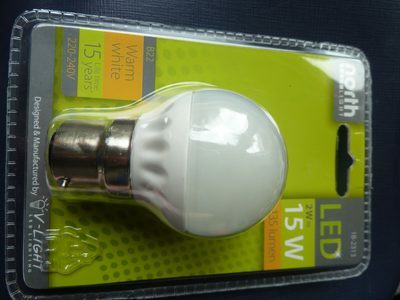 See mini reviews of various LED lamps below, divided into categories. 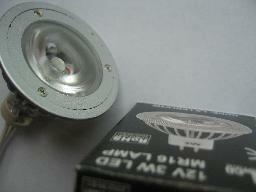 Small (Multifaceted) Reflector spotlight usually 12V bi-pin GU5.3/GX5.3 base. Hard-wired, or permanent, eg with flying leads. The ~20W CFL for our landing light died. I temporarily put in a 7W (~420lm) LED lamp replacement, but it clearly wasn't going to be bright enough. So I bought the brightest B22 bayonet LED lamp that Clas Ohlson in Kingston had to offer, which is this interesting frosted beast consisting of eight separate yellowy-orange LED filaments. Presumably this construction allows for a illumination pattern closer to a tungsten GLS bulb rather than a more typical LED point source or three. This also claims a colour rendering index (Ra) of 90. There was no non-dimmable lamp in Clas Ohlson at this output power (10W, 1055lm, ~75W incandescent equivalent). Normally I avoid dimmables because I assume that the extra electronics makes them more expensive and more fragile. Although we don't dim the hall light, this lamp has a pleasant soft-start feature and comes to full brightness over a short time (though under 1s to 60% according to the spec), which can be easier on the eyes in the dark! The claimed efficacy of over 100lm/W is impressive. The LEDON managed a mere 60lm/W about seven years ago! The LEDON was a premium product; this unit, product 18-1454, was £7.99. Clas Ohlson offers a two year guarantee, but suggests a 15,000h life which may be good for 15 years. 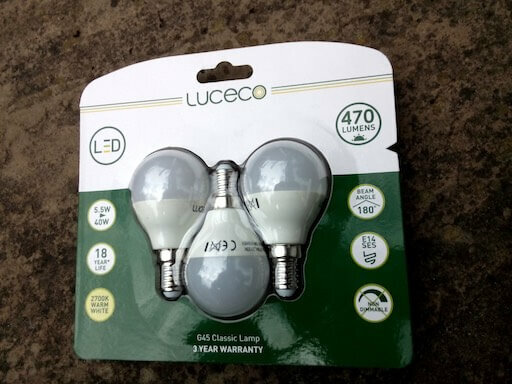 Good 40W incandescent bulb equivalent in size and light volume (450lm), part number A51KN, but a little more expensive than competing brands when bought at ~£20, though ~£15 at 2012/06/18 which undercuts them. Rated at 10,000h, and also comes in an ES27 screw/spotlight version (A50KN). We replaced low energy bulbs in a table lamp and an ceiling 'uplighter' shade. As both provide subdued lighting rather than light to read by we were perfectly happy with the brightness. Their light seemed a fraction whiter than our existing bulbs and we were fine with that too. 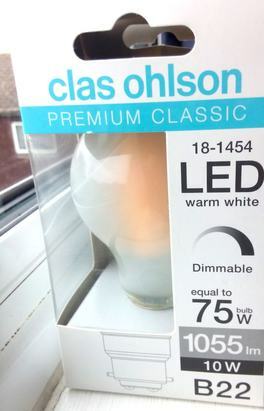 For £17.99 in Clas Ohlson I picked up on 2011/01/02 a 7W "north light" with a bayonet (B22) fitting, labelled as 7W (40W equivalent) 470lm warm white (2700K), and with a 'standard' bulb shape (like the TESS/EQ60s previously reviewed), stock item 18-2314, for test. The packaging claims a life of 15 years (15,000 hours) at 2.7 hours use per day. This lamp is not dimmable. Confusingly, part of the packaging states 100--240V 50Hz and elsewhere 220--240V; I assume that the latter is correct though it makes no difference for my purposes. There are other fittings and styles and wattages now available at Clas Ohlson, such as an ES (screw) base version of this lamp, but also SES (small screw) golf-ball and candle style lamps up to 2W, so there is a decent range available. None of them were displayed powered up, and surely people are going to be reluctant to punt nearly £20 on a new technology without even being able to see what it looks like lit? For my initial test I substituted this 7W lamp for a very-slow-to-start and insipid 9W CFL (CFLs of higher rating tend to be too big for the fitting) in our hallway which is only on for short intervals and for which instant-on is very handy, so the current CFL was not doing very well at all. Firstly, being the size of a standard incandescent bulb, it fits! Secondly, the instant-on behaviour is well worth having. Thirdly, this lamp seems noticeably brighter than the 9W CFL even when the latter has had a while to warm up. The light is even and warm and the lamp does the job. It also meets with the approval of my partner! On the strength of the performance of this lamp, we bought a screw (ES/ES27) version of this bulb (SKU 36-4241, 7W, 470lm, Ra 85, "warm white"/2700K, £17.99) to replace an expired 12W Philips "New Softone" CFL 2011/09/16 in the kitchen. And 2011/10/15 one to replace a 20W CFL in the bathroom, where its instant-on behaviour is valuable (it's rarely on for long); though as it's noticeably dimmer than the CFL after warm-up it was in time swapped out for the brighter LEDON 10W. Note that reviewer LD, see below, found both this and another LED lamp reviewed at the same time, far too dim and didn't like the light colour, but on reflection this seems to be as much about expectations as the lamps! Having changed the light bulbs without telling anyone in the house.... the intial reaction was 'oh I've been waiting for the bulb to 'warm up', I just thought it was being slow', this was said after the light had been on for half an hour! We had the bulb in our family room and we needed a second standing lamp on to provide us with the feeling that there was enough light to read/eat etc. The real issue was with the colour of the light, because it wasn't the warm yellow that we are used to. Even after 3 weeks with the bulb in the room, we still were unable to get used to the colour of the light. A second bulb was tested in my bedside lamp and again I found that the light level was insufficient to read by. All this said, I have not been put off using LEDs in my house, I will just search for warmer light rather than the cool white light and perhaps look for something which has slightly higher light levels for my bedside lamp. It had been hard as of end 2011 to get hold of anything more than about 7W (ie ~40W incandescent equivalent) for standard 240V domestic bayonet or ES fittings. I jumped at the chance to try the LEDON (Energy Saving Trust approved) 10W bayonet mains lamp though expensive at just under £30 including VAT. This has a 600lm output, and as advertised is 'very yellow' and to my eye more so than other 2700K-colour-rated 'warm white' lamps, and claims "exceptionally good colour rendering (90Ra)." A warmer and more orange tint to it than the slightly watery Clas Ohlson 7W. The first place we've been testing it is in our small bathroom, which long ago was lit by a 60W or 100W incandescent as I recall, but we had a 7W LED (~470lm) bulb there for a while which we grew used to. My daughter and and partner both commented on the new lamp being noticeably brighter, which should make it easier to spot dirt on us and the surfaces! Reading in the bath was slightly hard work with the 7W lamp; the new one is a definite improvement there. 2012/02/23 arrived from IstoriaLED four candle bulbs (3.7W, 200lm, 360 'effective' lm, 50000h, A+ energy rating, warm white, 240V/mains), identical other than for their different bases: ES14, ES27, B15, B22 (ie small and 'normal' Edison Screw, and small and normal bayonet). Physically robust and pleasing design, with three double-sided lollypop emitters. Slight green tinge to light, and less warm than especially CFL bedside lamps. Similar light volume to 8W/7W CFL (E14) bedside lamps and 3W Clas Ohlson 3W golfball. Very clearly lower light volume (to be expected) than 7W cool white LED in anglepoise; too dim to work by. Base of ES27 too hot to touch after extended use; more so than other similar LEDs. Several reviewers have now tried these out; one (LD) was disappointed by the light volume (possibly an expectations issue), though others (myself, HG, SB) have found it fine. Indeed, I am using the ES14 version in my bedside light where it replaces an 8W CFL (Philips) which in turn replaced a 40W incandescent and I feel that I am getting a good light level and colour cf the original! HG said 2012/05/23: "... we were perfectly happy with the brightness. [The] light seemed a fraction whiter than our existing bulbs and we were fine with that too." SB said 2012/09/10: "I think it's excellent. It is whiter than the other lamps in the same fitting but I prefer a whiter light. Unlike some people I like good bright, clear lighting and rarely choose the subtle more pink or yellow shades. It lights up faster than some of the other kinds of bulbs I have. So I'm quite happy with it." Both our children's nightlights 2009 onwards were these 0.5W LED mains plugs, a tiny 1/10th the consumption of the incandescent type that we used before. Note that they don't actually seem to draw less power when they turn off in daytime, and we turn them off manually anyway. We're very happy with these robust lamps. Note: even the puny 0.5W these consume is horribly inefficient in that the vast majority is being turned into heat rather than light. 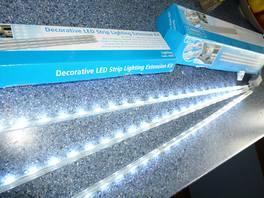 In 2011 I bought a basic Maplin 'decorative' LED strip lighting kit (A07JT) for the kitchen at the 'offer' price of ~£25, but only 'temporarily' fixed it up, actually sticky-taped (as very lightweight) under a cupboard above a work surface but we had not used it much as the quantity of light was maybe not quite what was hoped for. The kit includes a mains adaptor, three LED (cool white) strips, various connectors and fixings, allowing the strips to be assembled many ways. Nicely done. 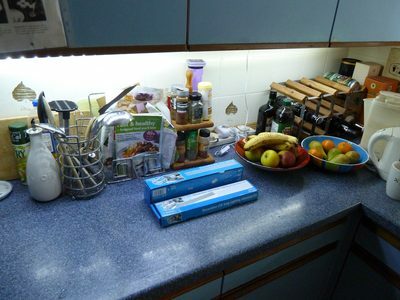 The extension kit of three more LED strips and more connectors and fixings (A08JT) that plugs into the existing strips and mains adaptor, came on offer again in Jan 2012 (~£15) so I bought one and fixed up the system properly to banish the worktop shadows between cooker and sink. The clips and screws are easy to use (the sticky pads were beyond me), and I'd put up the enlarged system in somewhere over half an hour. As of 2012/07/01 we're not using this lighting very much. 2012/09/07 measured 'on' consumption as just over 8W and off as undetectably low (nominally <0.1W) so can be left plugged in for convenience without being a 'vampire'. Given how some of our old Philips CFL 8W golfballs are fading, these seemed worth a punt, and at £2 each and reasonable efficacy, seem good value for money. In December 2011 we bought a Clas Ohlson golfball 2W 250lm warm-white (2700K) 15000h LED bulb with a bayonet (B22) fitting (18-2313) for the in-laws to use in place of an existing 15W incandescent night-light which is all ~8h/night every night. They seem to like it (and report it as brighter than the 15W). Should save them ~£4/y at 2012 prices, or a 2-year payoff. I bought a 4W SES spot (36-4237) for a friend to try at his train-station coffee stall, where it replaces a 40W incandescent. It seems a very similar level of available (cool) light, on 10% the power! At ~8h/day use I think it may be saving him about £1/month as of mid 2011, and though not all 10 of the positions are ripe for LED replacements (eg due to the steam belching from his fancy Italian coffee machine, where instead we have tried halogen bulbs at a 30% or ~30p/month saving) several of them are. They'd pay for themselves in electricity alone in 18 months, and maybe again in replacement incandescent bulbs in its 20-times-longer life (ie 20000h vs 1000h for the incandescent), never mind avoiding the fiddle and annoyance of replacing the bulbs. We replaced a second incandescent with one of these LED lamps ~July 2012, and he's happy with it. As of the end of January 2010 the 20W halogen lamp that we were reading to younger child by physically broke and was unsafe, so we spent £4 on a small simple bedside E14/ES14 (14mm Edison Screw) bedside lamp, and although it's not on much and we had spare ES14 incandescents I thought I'd see what LED lamps were available retail in our local shops. At least two shops had 2W candle-style lights available for ~£10, so I bought the Philips "AccentWhite" warm white from John Lewis. (Actual consumption seems to be 1.6W, with a power factor of ~0.4.) Nothing of a higher rating was (yet) available in that fitting in LED, though 7W/8W CFLs such as the one in my own bedside light are. Nominally it has 20 years' life (20,000h) though I suspect that it might outlast me! Note that this lamp takes a second or so to come on (though is then at full brightness, so is not 'warming up' like some CFLs), which can occasionally be slightly disconcerting. Update 2010/02/01: Today bought 2W 'warm' Philips "AccentWhite" candle ES14 bulb for younger child's room as reading lamp for ~£9. 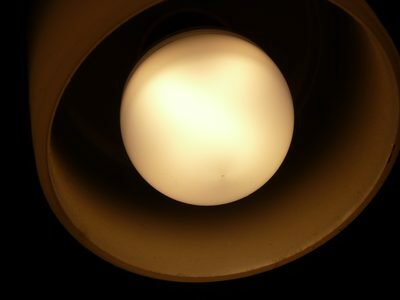 Update 2011/12/21: The 2W Philips lamp was replaced with a much brighter Clas Ohlson 3W 250lm golfball (36-4641) lamp. Extensive testing/use of a pre-production and production "warm" and "cool" Light Planet (TESS) EQ60 lamps (in kitchen spotlight and office anglepoise) over two years (2010 to 2012 so far) have been very satisfactory; pleasant solid light, though consumption measured at >7.5W. The bulb is light enough for my anglepoise whereas many CFLs have not been. As of 2012 the "cool" lamp is in daily use at my desk and is good to work by because of its light volume and colour, and the "warm" in the kitchen for its warm tone where it meets with approval. A colleague, doing an energy-sensitive refit of his house, found the EQ60 'warm white' too yellow and too narrow a beam for his purposes, (but found the "V3" GU10 spot's output beam remarkably wide and even). Another tester, who had complained about her 'too yellow' CFLs causing headaches found the 'cool' EQ60 too harsh and clinical. Trying to produce a third product in the range would be difficult, due to the commercial commitments on the current chip sets. May be able to introduce them at a later date. an EU energy-efficiency label (A-G) when one is available. 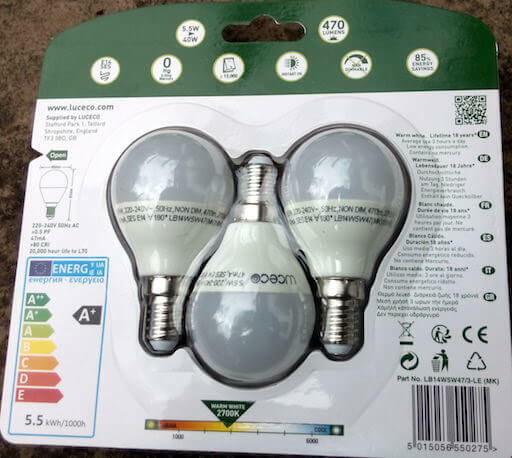 Update 2010/01/11: Just noticed in an ad the EQ60 60W replacement (ie retrofit) bulbs from Light Planet which is 7W/560lm, which is on a par with CFL if so, and these claim to be the same shape and size as an incandescent and at ~£15 could be a very good deal. I had a chat with Light Planet and I am buying one and borrowing another for eval for this page. Update 2010/01/14: The EQ60 lamps turned up today. Although the specs on the box are more modest than described on the phone to me (though this is from a pre-production sample/test batch), the ~7W ES27 (Edison Screw) spotlight is brighter and gives off significantly less heat than the (slightly aged) 12W "softone" CFLs next to it and is a really nice light, and is small (hardly anything will actually physically fit in that socket). If what's on the box is right then it's 7.5W/450lm (Cree LEDs), which is the same efficiency as a typical CFL. (Here is a US review of the same bulb.) The cool/daylight version is 560lm it seems, thus ~20% more photons for the buck. The box brand is 'tess' (from Taiwan), part T-67004, 200V-240V AC 50/60Hz, colour temperature 2700K ("warm white"), weight 125g, 108mm x 60mm, ES27. I need to measure actual power consumption. Update 2010/01/16: These new lights are going down well: we may well buy another couple of the EQ60s to replace failing or dead CFLs since we like the (warm) colour and haven't noticed any (eg RFI) problems... My power meter claims that the EQ60 draws 7.7W with a 0.45 power factor. Update 2010/03/10: Received 'production' EQ60s. No power measurements yet taken. Due to a mix-up a cool bayonet was sent instead of warm, along with the requested cool ES27 screw model, which feels a little harsh/clinical for some of the possible settings. The amount of light is astonishing and feels comparable to a 20W warm CFL, and knocks the socks off, for example, a 9W warm CFL I replaced in one location. Also, I was concerned that even the 120° beam would be too narrow for normal (eg non-spot/anglepoise) fittings, but though the colour didn't immediately appeal, the light spread seems entirely as good as for spiral/globe CFLs in the places I've so far tried these EQ60s. Will try these out in other settings and with other people over the next week. Update 2010/03/14: One relative who felt that her 'too yellow' (20W) CFLs were inducing headaches nonetheless did not like the 7W 'cool' LED as too dim and too 'harsh'. Update 2010/03/21: Measured consumption of EQ60 "cool" ES27 bulb at 7.1W--7.8W, power factor 0.57, better than the pre-production sample values (~7.7W with pf 0.45). Consumption starts at 7.1W and varied a little going as high as 7.8W. I think that if this is drawing 7.5W or above on average it should be rated 8W on the box; the '2W' Philips "AccentWhite" seems to actually draw 1.6W for example. It is good that the power factor is increasing/improving; that could ultimately result in less wasted energy upstream on the grid. Update 2012/03/04: I noticed that the EQ60 (TESS) ES warm light base had separated from the rest of the lamp, and was thus dangling by its wires, so I very carefully unscrewed the base from the socket with my fingertips, took some pictures, then superglued it back together, and after an hour or so screwed it back in the socket, and it worked! Construction looked reasonably robust internally. Update 2013/01: appears to have failed, which would be very premature, but I cannot rule out the possibility that the (crappy) spotlight fitting is at fault instead. Note: this bulb caused significant interference on a VHF FM radio about 2m away, unlike the CFLs in the same spotlight lighting strip. This item failed after a little over 2 years with Ultraleds offering no help even though one might find this early failure "not fit for purpose". 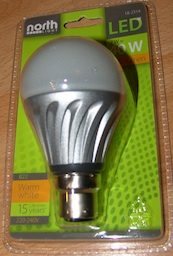 Update 2010/03/19: One of the first highish-powered domestic LED bulbs (5W Edison screw) that we have been testing failed after a little over 2 years' use. Ultraleds (and their MD) with who I had previously been impressed were dismissive about my suggestion that devices sold in part on a promise of long life should be considered "not fit for purpose" if they fail this quickly, regardless of nominal warranty period. Update 2012/02/01: I finally disassembled the unit to extract the board with 5 series LEDs, which draws 60mA@14V (0.8W), 200mA@15V (3W), 340mA@16V (5W+), ie about 3.2V/340mA for rated output, if heatsinked on the original case. So I could use it as part of my LiFePO4 battery dump load with care. (2016/08/07, Damon Hart-Davis) Picked up three cheap (£5 each) in the closing days of BHS in Kingston, even though I am skeptical about actual ratings vs 10% allowances, these seem to give similar light output to other 300lm+ GU10s, ie very improved efficiency over the older lamps, with a warm and pleasant colour. In our kitchen I have replaced 7W lamps with these with little apparent loss of illumination, bringing each of the two strings down to 20W as of 2016/08, for maybe 18kWh/y saved (3 lamps x 3W savings per lamp x 2000h/y on-time). That would be ~1% of our gross electricity consumption, largely when local microgeneration from solar PV is not available to supply it, thus reducing imports from the grid more as a proportion. James P of Furzefield International Limited offered me one of these Superflare GU10 6W 2700K lamps to review out of the blue, and as I'd just leant one of my favourite warm white GU10s to a neighbour having second thoughts about her new LED lighting, I was pleased to give this lamp a test. I like it; in a perfect world I'd aim to match or beat the 100lm/W I have elsewhere and have a slightly less warm/orangey shade at (say) 3000K+, and have a slightly cooler case when running too, but this does a good job as-is. In particular at the end of 2012 I have being trying to use warmer lighting in the evening in case it helps with sleep later, (and indeed running f.lux on Mac and Windows to adjust the display colour too), so the arrival of the Superflare was timely. The Superflare's light colour and volume was liked in our kitchen, eg as compared against the Aurora V3 and recent Clas Ohlson and unbranded SMD 5050, being brighter than all the rest and nominally pretty efficient. I also appreciate at my desk the light volume which is similar to the 9W dome lamp though a nicer shade and distribution (the Superflare claims a CRI of over 80 and relatively-wide beam angle), as well as again nominally much better on efficiency (A-rated, 90lm/W). 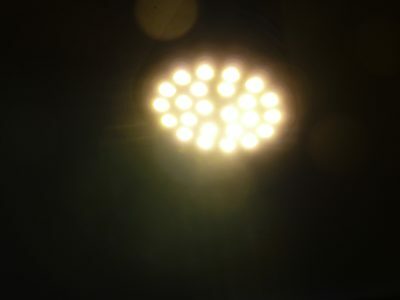 The lamp's 'Chip on Board' (COB) technology gives a wide solid appearance to the emitter, rather than a very narrow point or a number of such as is more common. 2013/06/12 took delivery of three more Superflare for use between the kitchen and my desk; bright pleasant warm colour and relatively low glare. 2016/08/07: Consistently pleasant to use and reliable over several years, have increased rating to 5/5. I broke my anglepoise that I'd been using with my 7W "cool" LED, finding the light volume from my 3W Livarno not always enough, and being slightly concerned about lots of research and media reports about bluer colours disrupting sleep when used (for work) in the evening, I decided to try an upgrade to the new 6W/380lm GUI (36-5094) lamp from Clas Ohlson 2012/09/05. The light volume and colour is good. I am finding it most comfortable to use the light indirectly, bounced off ceiling and wall, as sideways leakage from my unshielded gooseneck desktop is otherwise a little distracting. I don't have any way to test the dimming, and would have preferred a version without to save a bit of money and presumably improve overall efficiency though >60lm/W is fine as-is. The white apparently-ceramic body gets quite hot, though not burning hot, which presumably indicates good conduction of heat away from the LEDs which may help prolong the lamp's life. The pack is interesting in indicating a lifetime in power cycles (15000) as well as on-time (25000h) when generally LED lamps are not thought of as cycle-limited. Failed (went very dim) 2016/05/30: Clas Ohlson exchanged in store for equivalent without fuss (old 36-5094, new 36-3600 345lm/6.5W). I suspect that the new spec is equivalent to the old, with the prevalent naughty 10% "fudge factor" taken out on both sides. Light Planet on 2010/09/16 kindly supplied me with a "V5" 7W, 720lm, 38° beam angle, 5000K--6350K "cool", GU10 LED sample for evaluation, still in use every day as of 2012/07/08! Interestingly it is rated 100V--240V AC, so suitable for markets worldwide. The stated efficiency (~100lm/W) puts it well ahead of most CFLs. For example, a new 7W Philips "golf-ball" "warm" SES CFL is labelled as 310lm (and the equivalent of 31W incandescent), 10000h, 50000 on/off cycles, and 1.4mg mercury to boot. On the supplied scale, 720lm comes in at just under 60W incandescent. This lamp is bright (only a 40W or 50W GU10 halogen or good 12W CFL should be able to match or beat its light output in that fitting), and it is fast to come on. One generic point about these intense point sources rather than (say) CFLs, is that they seem much more headache-inducing when caught in peripheral vision, so their arrangement is more critical than just what they light; more smaller lamps, or more chips within each lamp, may help. This particular device has 4 emitters, whereas the Livarno light with 25% the lumens output has 15! I have now bought the 12V (MR16) version of the V5, also cool white, and it is every bit as bright as the mains (GU10) counterpart, and a stained-glass artist to whom I lent it has been very happy with its colour rendering at her work desk even though initially taken aback by its coolness compared to the halogens she was used to. Update 2010/09/16: Aurora "V5" 7W 720lm "cool" GU10 evaluation unit arrived from Light Planet (thank you!). Has a 4-chip array internally. 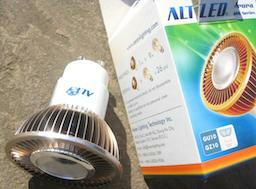 Should match/beat 40W of halogen GU10 or about 12W of a good CFL in light output, and is more efficient than CFL. 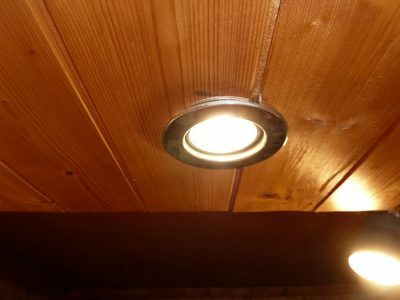 We have been testing a couple of the (warm) "V3 Ultimate GU10 LED Spot Lights" in a specially-installed 'test' lighting fixture in our kitchen (2010--). We're getting less lumens per Watt in this GU10 style than with the EQ60, but that's in part because the GU10 fitting is hostile to non-incandescent technology in general being designed to retain heat which is good for halogens but bad for LEDs/CFL. CFLs in this format seem to be limited to ~50lm/W also. The V3 light quality is pleasant, and unlike the CFL GU10 that the comparison is against, is almost instant-on (within a second). The 'warm' tone suits our yellow walls. The beam angle is 120° and thus barely a 'spot' in fact, which also suits our purposes fine. When alongside an Omicron 11W GU10 CFL (2700K), the LED is faster to come on (almost instant, with no "warm-up" phase) and of very similar colour after a few minutes when the CFL has stabilised. Both are fairly pleasing to the eye in terms of design and appearance, though the CFL has a longer body that protrudes from the fitting, so the LED wins on that element. We'll have continued ro like the light tone in the darker months of winter with less bright natural (cooler) light around. I can also report that it is pleasant to use at night, warm and full, unlike the watery 5W 'cool' LED lamps we tried in a similar position. We like the V3, and would only hope for a greater efficiency (lm/W) and greater power output (ie more light) in future revisions. From Alarms and Lightbulbs (note bulk pricing; I bought 1-off at ~£9 Jan 2012) this 3W 340lm 24-SMD chip GU10 lamp is nice and bright (not far off the 7W ~355lm Aurora V3s by eye) and does provide a slightly more spread and less-point-source beam, with a decent colour. 120° beam angle, claims to be brighter than a 50W halogen, 220--240V. I'd be slightly concerned about the SMDs getting covered with grot or even presenting a slight extra shock risk or moisture ingress route, but that may be overthinking the plumbing. The lack of branding would concern me in terms of expected life, but the lamp is pretty good for the price if that is no issue. Just for a bit of 2011 winter silliness I swapped out one of the GU10 (240V) lights in the kitchen (a 11W CFL) for a Maplin N27HA "1.5W Auto Changing Multi Colour LED GU10". Not especially bright but the colours are indeed "vibrant" as claimed; the kids like it. The first thing to be careful is that there are apparently as at 2010/08/10 two versions of this in circulation, one marked 15 year life and the other 25, and neither marked on the packaging with lumens output, and Philips' own site is coy too, and their customer enquiries initially suggested 300lm output which would be remarkable, and then a week later called me back to say 220lm. This confusion is unhelpful at the very least, and I expect better of Philips. I have borrowed one of the devices labelled as 25-year life (25,000 hours), which I take to be the same as this Argos 432/9244 lamp, which is given as 250lm, ie ~80lm/W, thus beating the V3 in efficiency if so. By eye the light output is not remarkably different from the 7W V3, even allowing for the slightly different light colour and very different beam (a spot at the 25° claimed on the packaging that I have), though a subsequent rough comparison with other lamps suggests that it is maybe less than 200lm, 150lm if Philip correctly identified it (see below). This bulb is slightly shorter than the V3, at 50mm, and does not protrude at all from our kitchen fitting. My daughter preferred this 3000K/warm light over the current 6000K/cool lamp in her bedside light. My partner liked the light quality in our kitchen. A friend Philip C, see below) described it as not looking "quite so much like a gadget from an episode of 'Blake's Seven'" compared to the V3! This lamp seems to be matching or beating standard CFL efficiency, which is hard to do to this style of fitting. At £20 it's still quite expensive, but the Argos page claims that it will last as long as 25 (35W) halogen bulbs at about £2.50 each, so likely cost-effective even ignoring the substantial energy savings. The adult-proof plastic display packaging is pretty but excessive, so another small black mark against this product. 2011/03/03: Philip C emailed me to say "Another week, another hardware change from Philips:"
It's this: http://www.johnlewis.com/227266/Style.aspx, which I think is the UK version of http://www.p4c.philips.com/cgi-bin/dcbint/cpindex.pl?slg=en&scy=dk&ctn=872790091824300 (certainly the specs that are on the boxes match, they look the same, and the barcode only differs slightly). As a downlight in my glass-fronted kitchen cabinets it's much more pleasant than the prior version, with the warmer temperature providing a similar hue to the cherry cabinet as a 35W halogen. Subjectively, it's also pretty similar light output. However, I wouldn't use it for more general lighting; there is a noticeable red hue (vs general warmness) when used for room lighting, with a particular red fringe at the edge of the fall-off cone. On 2010/09/02 Lidl had an offer of £5.99 for 3W LED lamps, in various fittings including GU10, Livarno brand (EDI Light GmbH), and claiming ~60lm/W on the box, ie about 180lm total. This lamp seemed less bright than the Econic with a by-eye comparison, but the beam angle of 90° of this lamp cf the Econic 25° confounds such testing. This does well in efficiency terms compared to CFL (at least as good) especially given the GU10 fitting. The light is a pleasant colour, and the multiple (15) emitters/chips (possibly SMD 5050 style) make for a less harsh 'point-source' feel. My daughter preferred this to her previous (6000K LED) bedside lamp, primarily because this illuminates the far end of her bed better given its broader beam; it seems to throw significant useful light beyond the 90° stated, possibly in part because of its slightly domed front. This comes on quickly, faster than the V3 for example. Like the Econic, this claims a 25,000 hour life. Our young daughter's bedside light was an unbranded 3W 240V mains GU10 "cool" (6000K) LED in a gooseneck lamp from 2008 up to late 2010 directed up at the ceiling as indirect lighting, replaced Sept 2010 with a Livarno 3W warm white GU10 also reviewed then later with a CFL 'kitten' lamp birthday gift, and worked well for her. It's officially my office soldering/closework desk/work spotlight, but I don't need it most of the time and it did well in this alternate role! When I was young my bedside light was a 60W incandescent; this is safer and cooler and probably represented a distinct energy saving. My daughter is also tester for other GU10/240V lamps that cross my path! Update 2007/11/07: I have been using the 3W LED MR16 as an uplighter most of the time over the last month or so, particularly later in the evening. Earlier, when the sun has just gone done, I prefer the brighter CFL sometimes. But note that I'm still entirely on solar PV powered lighting, and have not once yet run out of juice! Update 2008/02/17: I am still mainly using the 3W LED as I have since November, but there are times such as this evening when I go hog wild and use the CFL instead! We decided that it might help our daughter find her way to the loo in the night, and help us to get around at night without turning on the main overhead light on our upstairs landing possibly disturbing both children, to try a night light there. The upstairs corridor does not have a single power socket, so my first attempt was to try using a 3W (cool white) MR16 12V lamp from my solar off-grid system, temporarily hooked up at the master bedroom door. It's certainly enough to see by, even downstairs, but was too bright and kept us awake at night. Also the power drain is a bit more than I'd like from my off-grid system (the 'official' server drain is under 4W!). 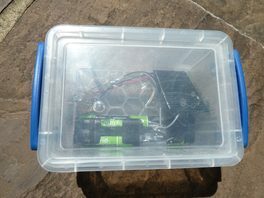 Now we have a homebrew solution based on rechargeable NiMH batteries that lasts several months between recharges, or more if the built-in solar cell is used to keep it all topped up. See the whole story! As of November 2012 we've had these two or three years with the only problem being a sticky switch between modes on the back, which is unusually good for this type of product. 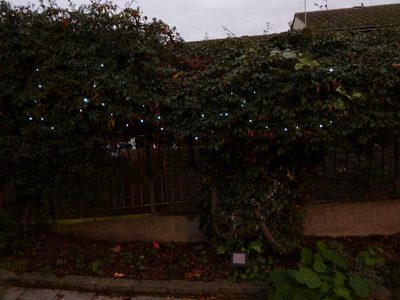 50 cool white LEDs on 9m of cable, solar powered, can flash or stay steady (how we usually have them), but no fancy effects such as running lights. In June 2010 we thought we'd look at a simple cheap solar-powered garden light to see if they are any use. They don't give out a huge amount of light and there is an embedded environmental and energy cost even if they don't need mains or batteries. We splashed out on two of these. These are very simple and cheap and physically small and light, possibly using a supercapacitor inside rather than a battery, powering a single cool-white LED pointing out the base of the unit through a clear plastic prismatic diffuser. The light given out is fairly weak but pleasant accent lighting; it wouldn't much help, for example, with navigating the garden at night. Each unit consists of a small 'amorphous' brownish solar cell on top, a black plastic body with a thin metal covering sheet, and a removable diffuser and spike for planting in the earth. Under the diffuser/spike is a switch to turn the light off, thus presumably saving its juice for another day or if packed away. My 19-month old boy managed to disassemble and break one unit fairly easily requiring the LED's leads to be resoldered to the board, but all-in-all the unit seems robust for normal uses! These could be nicely adapted to make solar-powered lights for a doll's house, or for children's night-lights with some extension of the LED leads (one seems to last about 4 hours when fully charged). All were dead after a year. Less kind is the fact that all the Wilko lights failed within a year, thus creating an e-waste (and emboddied energy) problem; let's hope these are better. These have the oddity that the little solar panels on top have a variable number of stripes (about 2--5) which indicates a very variable voltage for the electronics to deal with (albeit the gathered solar power will be the same). Update 2012/07/08: all working fine and alight as of 10pm so misgivings about the solar panel variability seems to have been misplaced. Update 2012/08/10: one seems to have failed a few days ago, possibly due to water ingress, and moving it / attempting to let it dry out, has not yet fixed it. Update 2012/10/07: only two are still working: very poor from a WEEE point of view, and I think that these failures within 6 months should get money back. Update 2013/01/01: all long-since dead: very poor. See RS catalogue page for Stock No 123-7961. Initial comparison with the Istorial 4.5W MR16s is that this is a little brighter than the 'warm' lamp and maybe a little less bright than the 'cool' lamp. This is nominally slightly lower lm out and higher W in than the Istoria warm, though historically many manufacturers rounded lm up and W down to allowed legal tolerances, so it is not possible to be sure! The RS lamp is much warmer, and the Istoria more watery. This lamp is getting hotter to the touch than the Istorias, which is reasonable given their huge metal heatsinks. Nominal specs: MR16, GU5.3, 12V, 5W, 2700K warm white, 345lm, A+ efficiency. Purchase price 2019/03 was ~£3.38 (inc VAT) per lamp, when buying three. At the Energy Solutions Expo October 2011, IstoriaLED very generously gave me a couple of review samples (one warm/2700K+, one cool/6000K+). Both have an A+ energy rating, are 4.5W and 351lm (650 eff lm) and 50000h life. Initial subjective testing suggests that the cool light is nearly as bright as my 720lm/7W Aurora V5. The cool seems much brighter than the warm (I expect some difference, but not this much). I'm a big fan of these and work by the "cool" lamp at my desk instead of the 7W mains EQ60 as of 2012 sometimes to be completely 'off-grid' for lighting. I've lent both the "warm" and "cool" lamps to a friend (MF) considering replacing 12V MR16 halogens in his bathroom for energy efficiency reasons, and once he'd overcome some transformer trouble (not liking the very low load that these lamps present cf halogens) declared that he would be happy with either colour and that the light volume was good for his purposes. Maplin part N19HT, claims 50000h life, 30° beam angle, 3150K light colour, 12 DC/AC. Light colour is fine, ergonomics OK also. Bought this in a hurry for a school educational exhibit (early 2012) without noticing the poor luminous efficacy (~37lm/W) at about half that of good lamps in this style and maybe only three times that of halogens. Fine direct efficient replacement for existing incandescent lamp/bulb in existing torch. Worked well will NiMH rechargeables with very long life per charge and little appreciable dimming. Cool white light. Outlived the two (cheap) torches that I used it in! Decent 12V warm light bought 2008/08/22 that as of 2012 I still use as an alternative to my "cool" mains or 12V desk lighting from time to time. Good light volume (~40W incandescent equivalent) in interesting 'bulkhead' design. Bought 2007/06/04 and used until only 2007/09/23 as too dim to work by, but it was the first decent-output LED I had. Still in use in 2014 as a test and a part of the dump load on my LiFePO4 battery system. Has flying leads for connection. "Cool" white colour. Robust build for exterior car use for 'modding' visual effects, which I take also to mean electrically robust. Update 2007/09/23: I stopped using the 3W LED 'car modding' light as backlighting some time ago, various others used since then including 6W warm-white LED ~2014. 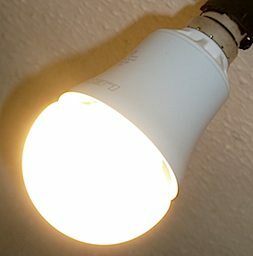 2018/08/11: Switch on to LED lightbulbs before September’s halogen ban: "From the end of this month halogen lightbulbs are to be removed from the market across Europe, with households expected to switch to LED lights — which cost more but last far longer and use much less electricity than energy-hungry halogens. ... Halogens are hugely wasteful of energy – the Energy Saving Trust estimates that the typical halogen uses £11 of electricity a year while a replacement LED would use only £2 worth. What’s more, halogen bulbs typically fail after about two years, while LEDs should last for around 15 to 20 years on the same usage." 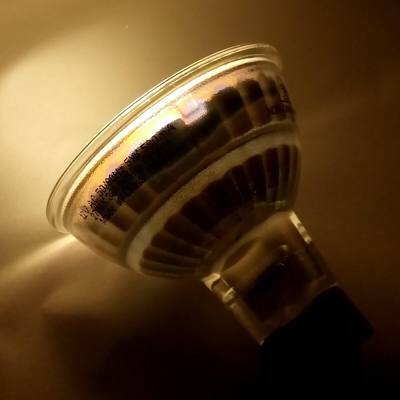 2018/07/25: Behold the revolution: LED bulbs are now as cheap as incandescents: Lloyd Alter tweeted that "When we start[ed] looking at LEDs on @treehugger they cost $50 outputting 500 lumens. Now they are under two bucks at 800 lumens. This is a real revolution." 2018/06/13: Energy Efficiency in Unexpected Places: The Dubai Lamp: "The Dubai Lamp is a product line of LED-based advanced lightbulbs. The largest is just 3 watts and emits 600 lumens, for an amazing efficacy of 200 lumens per watt." 2017/11/29: Energy Saving Trust: Let the light shine in with energy efficient lighting. 2017/08/03: Putting the spotlight on LED lighting over energy and cost: "New research on LED usage in UK homes suggests a welcome shift in consumer focus to energy efficiency rather than price ... " and " ... 73 percent of UK homes have fully switched and Sainsbury’s has recently become the first British supermarket to switch to LED lights completely as well. Why? Because people are starting to seek lighting sources that are both green and inexpensive." and "Energy efficiency is the most important factor for British people when buying any light, according to research ... "
2017/05/02: Five tips for choosing the right light bulb. 2015/10/27: Which LED Light price comparison service. 2015/05/15: Excellent how-to "All About LED Lighting" guide. 2014/10/22: 60% of people think switching to LEDs would save £100 per year. The actual saving would be £300! YouTube "electronupdate" LED review/teardown channel. GX5.3 or GU5.3 base bulbs can be used in a GX5.3 socket, but only GU5.3 bulbs can be used in a GU5.3 socket. 2013/04/11: Energy Star LED light bulbs are a rare breed. 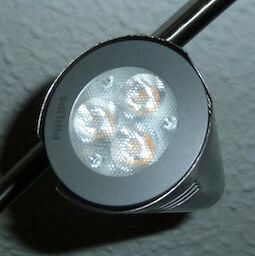 2013/04/11: BBC: Philips 200lm/W LED. 2012/12/30: Cree Introduces 200 Lumen/Watt Production Power LEDs. 2012/11/15: New 20W (100W incandescent equivalent) retail LED lamp from Osram Sylvania in the US. 2012/11/10: Philips Hue LED light bulbs including colour changing and remote control. 2012/10/10: BBC: LED at 50: An illuminating history by the light's inventor. 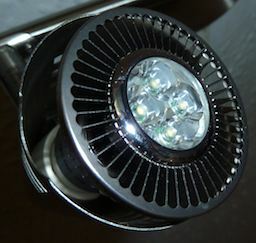 2012/08/20: Are LEDs still the future for lighting? LEDs have been lauded as the eco-friendly answer to all our lighting needs, but are they as efficient as we think? "At a chip level we are currently at 150 lumens per watt, but by end of this decade, that figure will be [250lm/W]." 2012/06/20: Two-and-a-half-year study finds light-emitting diodes could lead to energy savings of 85% from street lighting alone. 2012/08/31: Light goes out for incandescent bulbs: From 1 September, an EU directive aimed at reducing the energy use of lighting means that retailers will no longer be allowed to sell 40W and 25W incandescent bulbs. Similar bans came into effect for 60W and 100W incandescent bulbs over the past three years. The restrictions are predicted to save 39 terawatt-hours of electricity across the EU annually by 2020. 2012/06/11: Spectral Extravaganza: The Ultimate Light includes this: "The lumen is defined so that at the peak of the photopic sensitivity curve (555 nm), one Watt of photon power will carry a brightness of 683 lumens. We can then describe the luminous efficacy of a monochromatic 555 nm source as 683 lumens per Watt (lm/W)." So that is the theoretical maximum efficiency in lm/W, though "white" light is more like ~300--370lm/W max, but also see this paper claiming ~250lm/W maximum for white light. 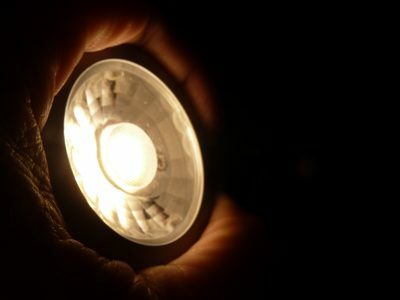 2012/06/01: In lightbulb lab, LEDs have been on 8,000 hours and counting. 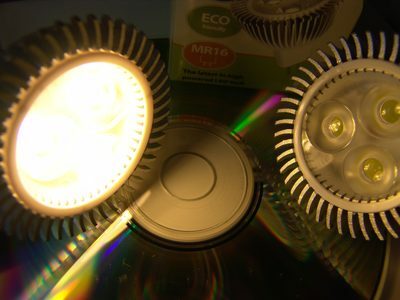 2012/05/09: Want to switch 12V MR16 halogens to LEDs? It's more likely to work well if transformer is rated "0+" ie will work with a very low load. 2012/01/16: Lighting the Way for LED Development including colour-shift, efficiency and life-time effects of heat on LED devices. 2011/12/16: Energy Saving Trust Lit Up: an LED lighting field trial (PDF report) and BBC write-up "At the 35 sites in the field trial, the authors of the Lit Up report calculated that the LED fittings saved more than three million kilowatt hours (kWh) each year when compared with the previous lighting." 2011/12/07: GBF thread Buying LEDs Direct from China. Measuring the performance of a lamp in lumens allows direct comparisons of light quantity (which is the service actually offered by the lamp). Comparisons based on wattage are not meaningful any more and can be misleading. Look for 1300-1400 lumens for the equivalent of a 100W incandescent bulb, 920-970 lumens for a 75W, 700-750 lumens for a 60W, 410-430 lumens for a 40W and 220-230 lumens for a 25W bulb. 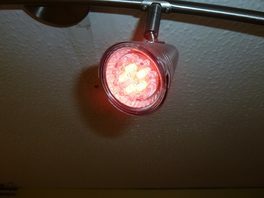 2011/04: Green Building Forum thread including DIY lamp constructions and recommending www.led-tech.de and leds.de. 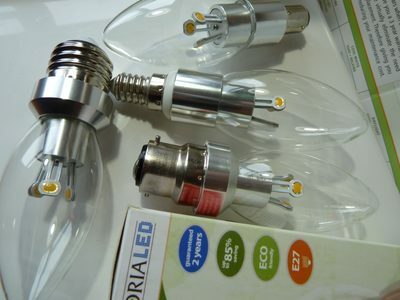 2010/09: From September 2010, c/o EU directive 98/11/EC: domestic lamps have (mainly) been required to be labelled with lumen (lm) output more prominently than Watts, which should help with direct comparisons. This Directive shall apply to household electric lamps supplied directly from the mains (filament and integral compact fluorescent lamps), and to household fluorescent lamps (including linear, and non-integral compact fluorescent lamps), even when marketed for non-household use. Where an appliance can be taken apart by end users, for the purposes of this Directive the 'lamp' shall be the part(s) which emit(s) the light. those marketed or commercialised as part of a product, the primary purpose of which is not illuminative. However, where the lamp is offered for sale, hire or hire purchase or displayed separately, for example as a spare part, it shall be included. 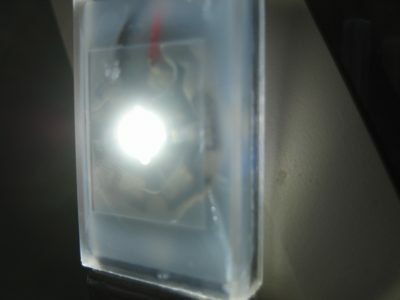 2010/02: Cree announces >200lm/W white LED in the lab, which is ~80%+ efficient in conversion of electricity to light. Mondo Arc ("The International Magazine for Architectural, Retail and Commercial Lighting") LED section. 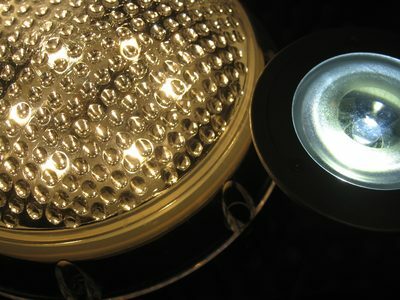 GreenAge: Cost Comparison: LED spotlight versus Halogen spotlight. 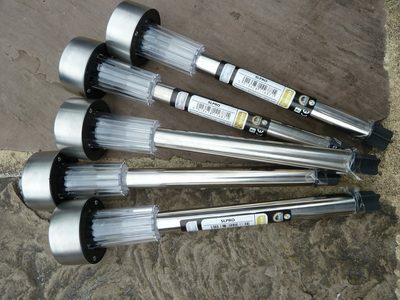 UltraLEDs: suppliers of a wide variety of mains and low-voltage LED lamps and gadgets. This warm-white (3500K) 9W 500lm LED dome lamp seems to be very nearly at CFL efficiencies, ie ~56lm/W compared to nominal ~60lm/W for CFL (and ~12.5lm/W for a 500lm, 40W, 120V tungsten-filament GS (General Service) incandescent whose light colour/temperature the dome is emulating, making the LED dome lamp more than 4x more efficient). Read about LED spotlights at Renewable Energy UK. A video on the history of the LED starting with carborundum! 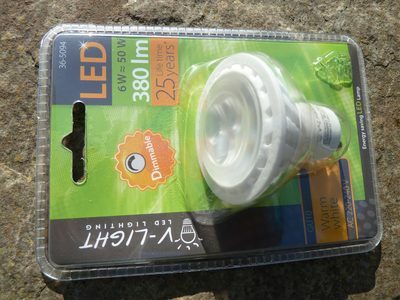 2009/09/16 Panasonic: New LED bulbs shine for 19 years; A/C mains dimmable "EverLeds", with efficiency of over 80lm/W. Osram study indicates that only 2% of lifecycle energy of LEDs and CFLs is 'embedded' ie in manufacturing, so total lifecycle energy 20% that of incandescents. US DealExtreme Flashlight DIY Parts & Tools category, LEDs galore! BBC story on safe disposal of broken CFLs, and the US EPA's advice too. First published 2007-06-25 , updated 2019-04-18 , rebuilt 2019-04-19 . Site copyright © 2007-2019 Damon Hart-Davis. Hosted by ExNet.